Why use toxics around your baby? You never want to put your baby in harm's way. But Volatile Organic Compounds (VOCs) can be inhaled into a baby's lung or absorbed through the skin, and many are known or suspected to be carcinogens. 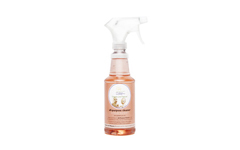 This All-Purpose Cleaner does not contain VOCs or any other toxin that might leave harmful residues after use. Ingredients: Food-grade natural surfactants composed of Glucoside (sugar) from US corn, Cocoyl Amide (coconut) and palm fatty acids; natural spring water and natural apple extract or organic lemon oil. PH balanced. No alcohol or solvents of any kind; no butyls or glycol ether. We only use plant-based surfactants so you can feel safe knowing that you are not exposing your baby or home environment to harmful chemical residues or fumes. Organic Lemon Oil has long been coveted for its antiseptic properties as well as an uplifting aroma. Available in Apple and Lemon Fresh.